Next to the riverside in Rotherhithe, you might come across a patch of neatly maintained turf surrounded by modest houses – and poking out of that turf are the remains of an old stone wall. 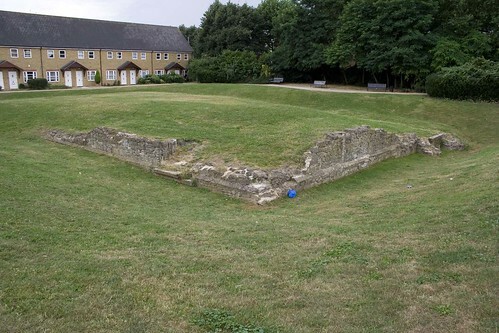 This is in fact the remains of King Edward III’s manor house, as a small sign next to it will confirm. King Edward III was crowned aged just 14 in 1327, and the deposition of his rather useless father and reigned for 50 years until his death in 1377. Quite when the Manor House was built is however uncertain, although, the earliest references are from 1349. The manor comprised of two courts, that to the north being adjacent to the river, and being the principal court., surrounded by a moat and wall. It doesn’t appear to have had any significant grounds attached to it as would be normal for a Royal Residence, so there is general speculation about its purpose. The moat has long since vanished. Uncovered only in 1985-7 as part of the Docklands redevelopment works, the Manor was probably sold to a pottery in the 17th century and slowly built over by subsequent warehouses and factories. 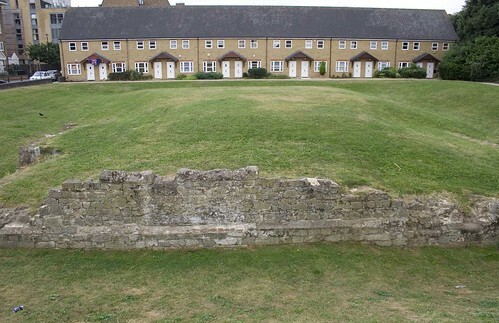 A single wall from the original manor house survived until 1907, but no later – and all that is left today is the outline of the main building. Sadly, more of the building was once visible, but it was covered up in 2005 due to problems with vandalism, and covering it up seemed the best way to preserve it for future generations. I can’t honestly say it is worth travelling to see, unless you are an ardent fan of stone walls, but certainly is worth a short detour if you are in the area (map link), and there is a pub right next to it if you want another reason for the detour.